If performance is what you require most from a laptop or desktop PC, one equipped with an SSD boot drive is the way to go. On average, for long sustained operations, an SSD drive writes data three times faster and reads data twice as fast as the fastest standard hard disk drive. The figures for activities undertaken at peak performance are even faster. The installation of an internal 2.5-inch SSD drive (which all use the same SATA interface as a hard drive) in a desktop PC is easy if a caddy comes with the drive, allowing it to be installed in a 3.5-inch drive bay designed for 3.5-inch hard drives. A 2.5-inch SSD should be able to fit into any laptop that uses an SATA 2.5-inch hard disk drive.If you want to upgrade an ageing laptop, replacing its SATA hard drive with an SSD is running at least Windows 7 is a worthwhile thing to do. The SSD uses less power, therefore less battery power, runs much cooler and is much faster. Note well that it is not guaranteed that a desktop PC or laptop that can run an SATA hard disk drive will also be able to run an SSD. For that reason, you should always check if a PC or laptop supports an SSD, especially if it is relatively old. The Advisor Tool on crucial.com can tell you if your PC or laptop is SSD-compatible. The image below shows the results for the Asus P8b75-V desktop-PC motherboard. Both memory and SSDs are available for that motherboard. Some SSD drives come with a 3.5-inch caddy (also know as a drive cage or enclosure) and some provide cloning software and an external hard-drive enclosure that is used to transfer the data on a hard disk drive to an SSD drive. If an SSD drive doesn’t come with any of that stuff and you need it, you’ll have to find your own alternatives, so, if you don’t want to search for them, make sure that they come with the drive. Free cloning software is available, often from the drive manufacturer’s website and elsewhere on the web. Some laptop PCs come with a spare drive bay that allows the installation of an extra hard disk drive or SSD drive, but the installation can prove to be problematic. If so, it might be easier removing the optical CD/DVD drive and installing an SSD or hard drive in its drive bay. A 400GB PCI Express Intel 750 Series Solid State Drive. Click on the image to view its full size. 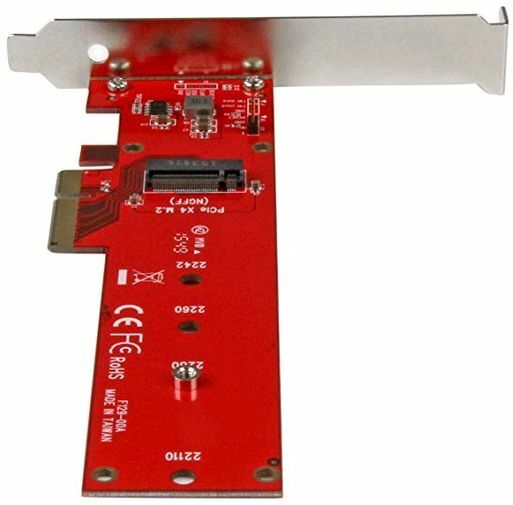 Note that it is possible to buy a SSD in the form of a PCI Express adapter card, shown in the image above, that fits into a PCI Express Express slot on a computer’s motherboard relatively cheaply now compared to the thousands of $/£ they were priced at only in 2013. The PCI Express 400GB Intel Series 750 Solid State Drive, shown above, was priced at £270 in September 2016 on Amazon UK. The following article provides information on the Intel SSDs that have relatively expensive 3D NAND chips at affordable prices. The image below shows a PCI Express (PCIe) adapter card for an M.2 SSD. An adapter card of this kind makes it possible to install an M.2 SSD if the motherboard does not provide an M.2 slot. To install the M.2 SSD just plug it into the socket and screw it to the card with the single screw. The image below shows an M.2 SSD adapter card that can host drives from lengths 2242 to 22110. Click on the image to view its full size. For more information on the lengths and install keys of M.2 SSD drives visit the following page on this website. The 350 and 700GB capacities, selling for $3,495 and $6,995.